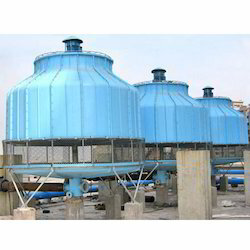 With our sustained efforts & dedicated management, we have been able to manufacture and export qualitative Dry Cooling Tower at reasonable rates. We offering the Natural Draft Cooling Tower. These natural draft cooling towers are manufactured with state of the art technology and helps in cooling with natural air traveling inside. As these feature efficient spray system designs, these are able to deliver efficient performance in comparison to other cooling towers present in its category. 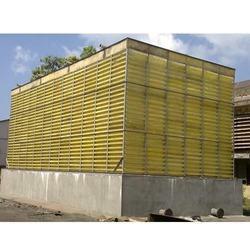 Natural Draft Cooling Tower is developed on the principal of an advanced spray technology. The size of the droplet of Natural Draft Cooling is controlled so as to facilitate an increased rate of evaporation without compromising on the drift loss. 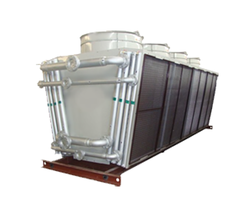 We are manufacturer and exporter of quality Cooling Tower that are offered in both counter and axial flow models. The FRP towers are widely used in air conditioning plant, induction furnaces/sheet rolling mills, chilling plant/refrigeration, diesel generator set/turbines, injection molding/plastic industries, automobile industries and mechanical and forging industries. These towers are manufactured using high grade material that makes them corrosion resistant, and helps in resisting water borne bacteria and organisms. This is light in weight, which permits roof installation with special reinforcement of any kind. The special construction helps in consumption of less power because of a lesser amount of air resistance to water.